Iranian gravestones are something special. Displaying wonderfully carved inscriptions and decoration, they can be read on various levels: decorative, textual and symbolic. In the case of a gravestone from 10th century Nishapur it was exactly what emerged from the analysis. Just a case? I believe it’s not. 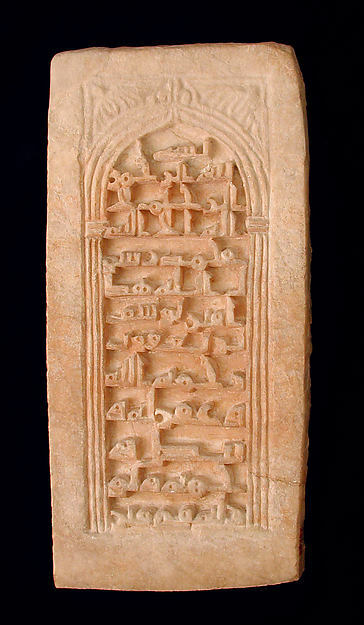 That’s why I have decided to dig somewhat deeper in the field of Iranian 10th century gravestone from Nishapur, taking into account another piece kept at Metropolitan Museum (acc. num. 36.20.27). Again, in the case of the decorative design, the gravestone reproduce the image of the mihrab, the two-dimensional niche that, as been said and re-said, is particularly closed to the theme of the death, and presence of God. The same decorative theme is to be found in different periods and places, but mostly related to a funerary setting, as Khoury pointed out in an enlightening article. In short, the image of the mihrab is related to the Light Verse, on the one hand, and to the presence of God. In the inscription, once again, the reference to the Light is well underlined, in the use of formulae which seem to be standardized, if we compare this tombstone with another gravestone from the MetMuseum. Muhammad is / the Messenger / of God. may God be merciful to him / grant him pardon and / whiten his face, / and illuminate for him / his grave. 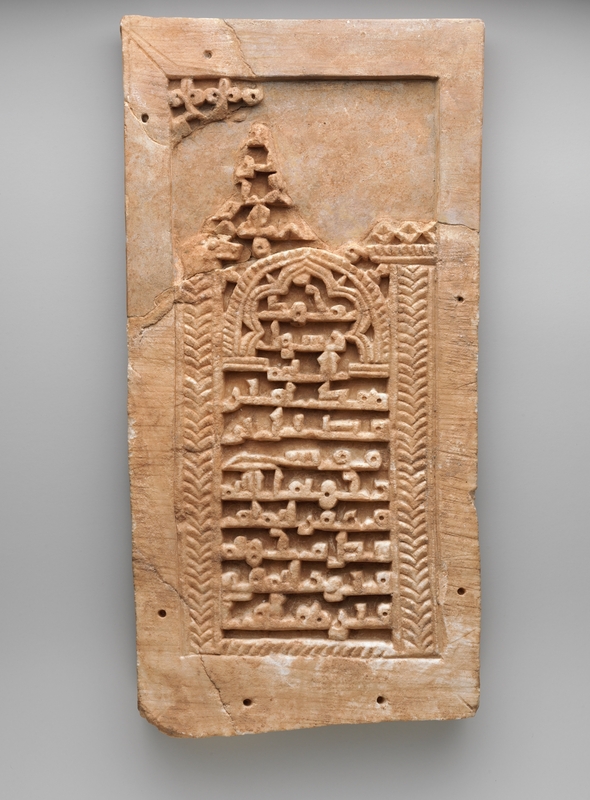 The basmala is missing from the text inscribed within the two-dimensional niche. It is most probable that those part was carved in the upper part of the slab, above the image of the mihrab, together with the decoration. In that part I can recognize a letter that can be a ra’ or a nun, most probably. What I think is that gravestones were produced, in 10th-11th century Nishapur, by the same group of artisans, or at least by different groups, relying on same models. This gravestone is thus part of the same environment of MET 34.152. This would mean that in the period, a standardization of gravestone types was produced and developed, relying on the same decorative types and formulae. This is something not uncommon at all: also in 12th century gravestones from Yazd we an notice a similar standardization of text and design, or patterns. What does it mean? I don’t know yet, but certainly it can be said that tombstone production was based on a strong tradition, carrying symbols and features recognised and most probably understood by everyone (or the majority of people, at least): these gravestones confirm the development of patterns and features linking the image of the mihrab with funerary practices in Iran.